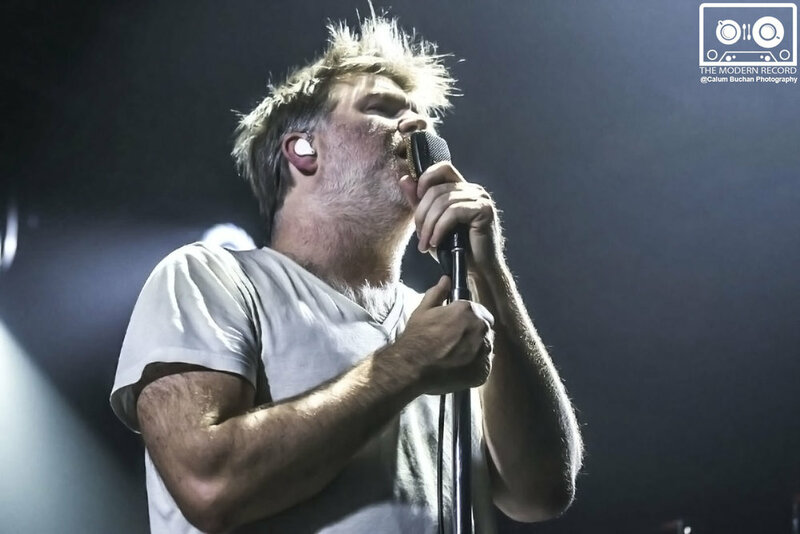 The news of LCD Soundsytem’s return to Glasgow seemed to create a point of contention when they announced their 2 night stint at the Barrowland earlier this year, as it has with fans around the world. 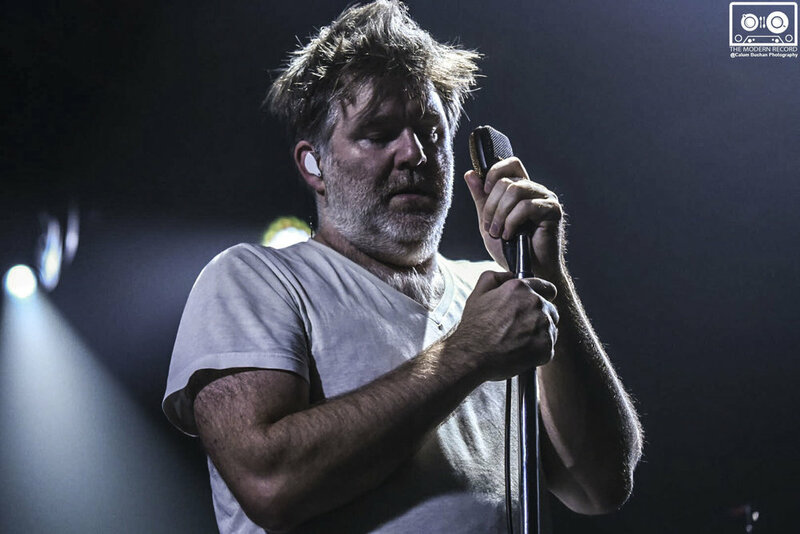 After bowing out at Madison Square Garden in 2011, complete with a live album and DVD boxset package to sell to their fans for years after, it doesn’t seem unjust that many where outraged at James Murphy’s decision to reform the band in 2015. Their long goodbye seemed cheapened and accusations began to fly about the reunion being solely about financial gain for all parties involved. Now, after the release of their critically acclaimed new LP ‘American Dream’, James Murphy brings their big comeback to Glasgow. The audience that made it through the doors early where treated to a reasonably lengthy set from Hot Chip’s Joe Goddard. His set was successful in setting the evening’s mood, tricking the audience into thinking they could be in a low-ceilinged club rather than the Barrowland’s grand dancehall. Goddard managed to successfully blend Hot Chip’s signature sound with EDM and contemporary pop in a set that was both intriguing and an excellent set up for what was to come. 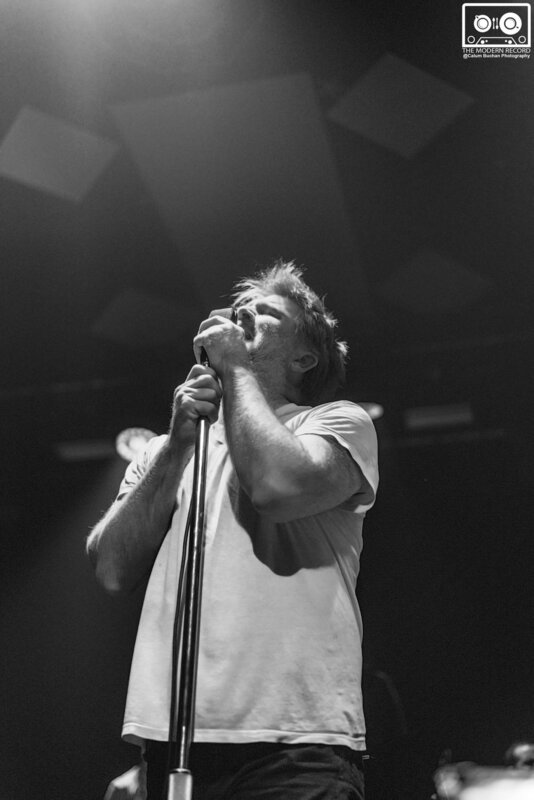 By the time the lights dimmed for LCD to hit the stage, the Barrowland was bursting at the seams. There was no discrepancy about the show’s sellout, there was hardly an inch to move from the front barrier to those at the back opting to surround the sound desk. It was no surprise that the applause was deafening when the octet emerged to operate the analogue synths, keyboards, pads, triggers, percussion, drums and guitars that dominated the entirety of the stage. They opened strong with ‘Get Innocuous’ from their seminal album ‘Sound of Silver’. The heavy electronic loops, blips and beats got the audience, of no singular demographic, enthusiastically swaying and jumping straight away. Murphy was modestly dressed in jeans and a plain white t-shirt with his trademark shaggy hair and beard. He seems to be able to do what very little front-men of this caliber are able to do in their mid-40s. After several years of accepting that he’s lost his edge, Murphy presents himself with honesty and legitimacy. Their unique blend of dance-punk continued with ‘This is Happening’ cut ‘I Can Change’ and new single ‘Call The Police’. Murphy’s record collection seemed to rise to the surface every so often with strong tinges of Talking Heads, David Bowie and Daft Punk transpiring on stage. At this point in the set, all 8 members where utilised to great success. Synths and guitars blended beautifully, creating franticly energetic layers of melodious polyrhythms. The stacked vocals lifted the sound hypnotically, the crowd chanting every word with harsh dedication. 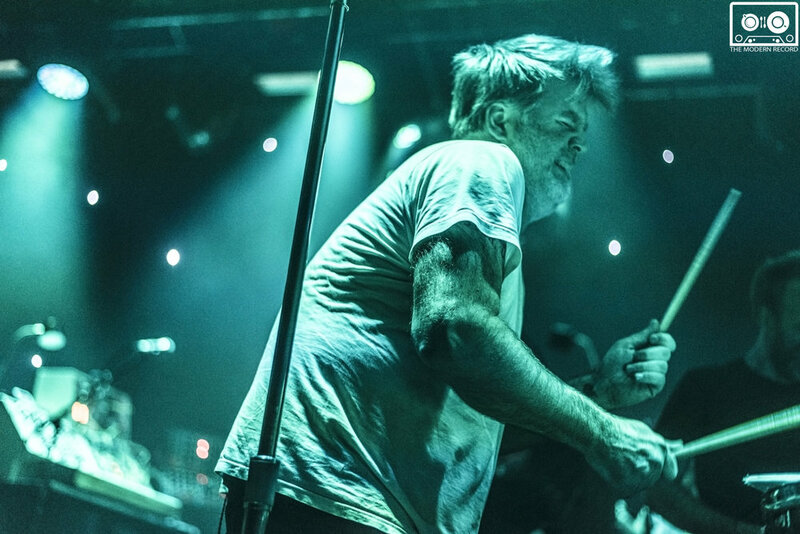 Great interplay between different members of the band such as Murphy’s playing of Mahoney’s drumkit and pouring wine into Doyle’s mouth mid guitar solo showed that LCD Soundsystem are both a slick and entertaining machine. Fans were treated to a fair spread of material from across LCD’s discography. Thick lead synths bounced off the walls during ‘Tribulations’ and ‘Movement’ whilst Murphy seemed pensive and subdued during the glockenspiel-laced ‘Someone Great’. New additions fared well with ‘Tonite’ providing what seemed a welcome social commentary, frantically speak-singing lines such as “you lost your internet and we lost our memories” before a devastatingly powerful crashing hits outro. It was hard to miss the large exodus of fans leaving to go to the bathroom or get a pint during ‘I used to’ but this decision was to their loss as this was one of the most encapsulating moments of the evening as Murphy’s vocal lines soared above lush keyboard harmonies which created a much-needed ambience in the set. Murphy upheld his honest façade by announcing their encore as “4 minutes to allow us to go and pee” before an emotive rendition of ‘New York I Love You, But You’re Bringing Me Down’. As the crowd just about collapsed the building by stomping aggressively and cheering profusely, Murphy seemed overwhelmed and it’s hard not to be. Not a single person hadn’t given it theirall in the audience, uniting people of all ages and backgrounds. He thanks them for allowing them to bring their best as he closes the night with his legendary hipster rant ‘Losing My Edge’ and the modern classic ‘Dnce Yrself Clean’ which initially brought down the dynamics before allowing the shattering drop to get the place moving and singing for the penultimate time. ‘If I could see all my friends tonight’ Murphy desperately chants with the crowd raising their arms and shouting along with extreme dedication as the show ends. Looking round and seeing the passion of the audience was one of those rare moments of grandeur that induced goosebumps. An impressive feat for a venue far smaller than an arena or stadium. The line also serves as a sort of answer to those confused by the reunion. The debate of the reasoning behind it becomes irrelevant under the realisation that LCD Soundsystem are one of the few bands that can inclusively bring anyone and everyone together to a show to just dance and forgot their worries without neglecting to have something to say.